A cute, cruel adventure where your character dies every sixty seconds. What is it? An adventure where you die every minute. No matter what you’re doing in Minit, no matter where you are, you will drop dead every sixty seconds. Life in this cute top-down adventure is fleeting, and you only have a minute at a time to solve its puzzles, talk to its characters, and complete its quests. A timer at the top of the screen ticks down relentlessly, and you are forever at its mercy. That all sounds very dramatic, but Minit isn’t completely sadistic. Some of the items you find, such as a sword washed up on a beach, will carry over to your next life, opening up more areas to explore. And as you traverse the world you’ll find houses that will act as respawn points. So with every bite-sized life you’ll make a little more progress, explore a little further, until you lift the curse and end this temporal torment once and for all. Although it has the feel of an early Zelda, Minit is really a series of puzzles. The nameless duck protagonist (at least I think they're a duck) finds items fairly regularly, granting them a variety of powers. A cup of coffee will give you the energy to push boxes and open up new paths. A glove lets you throw your sword and attack distant enemies. The watering can lets you extinguish fires. And with every item found, another obstacle can be bypassed. When the game begins you’re trapped by a row of bushes, but once you’ve found the sword you can cut them down. Later on, a bridge won’t be fixed until you deal with some bandits on the other side, which is where that sword-throwing ability comes in handy. And you repeat this cycle until every corner of the map is accessible. You will die in the process, a lot, but not just at the hands of the timer or the enemies roaming the map. You can kill yourself at the tap of a button, and I found myself doing so distressingly often. If you know you won’t be able to complete your current task or reach your destination in the time you have left, it’s easier to just hit the death key, respawn back at your house, and try again. The problem with this is that death, rather than some looming, ominous, ever-present threat, becomes little more than a minor inconvenience. And sometimes, when you’re stuck on a puzzle, it can be annoying too. 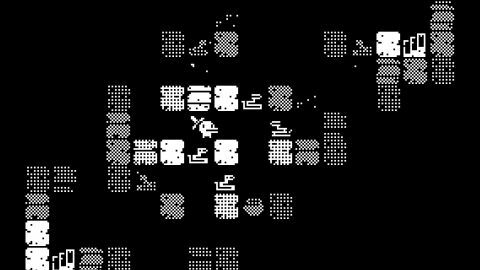 Minit has no real stakes, which cheapens the timer system and makes it feel somewhat arbitrary. I left the game thinking the concept was ultimately more interesting than the execution, but the developers do use it in some clever ways. These reservations aside, I still had a lot of fun playing Minit. I love the stylish, monochrome art, which squeezes heaps of personality into just a few little black-and-white pixels. The light-hearted dialogue is endearingly silly, and some of the puzzles were pretty satisfying to solve. The constantly ticking down death timer is arguably more of a novelty than anything else, but it does make for a unique, if occasionally frustrating, experience.